The first time I went to Corazón y Miel I asked for tortillas. “We don’t serve them,” the waitress said drily. She didn’t add “Snap!” but I heard it. After all, why would there be tortillas here? Because the restaurant’s name is Spanish? Because we’re in the working-class Latino neighborhood of Bell? Because there’s a chef named Eduardo Ruiz in the kitchen? Actually Ruiz is precisely why you won’t find tortillas here: He’s not someone who likes to follow a set course. One starch you will find at Corazón is homemade, naturally leavened sourdough, which brings out all the toasted glory latent in the cascabel chile cream that swirls on the surface of a calabaza, or squash, soup. Ruiz toys with expectations in the same way that Carlos Salgado does at Taco María in Costa Mesa. It may sound like a generic stand, but you’re quickly disabused of that notion when you see a tasting menu—the “Hecho en Orange County” logo printed at the bottom—pairing, say, a pour of steely Castilian verdejo with a roasted beet salad that showcases goat fromage blanc and crinkly-skinned pistachios. You can’t even find tacos on the dinner menu at Taco María; they’re served only at lunch. Like it or not, these chefs are sending a message about heritage—what essayist Richard Rodriguez calls “those elastic, sturdy strands that bind generations in a web of inheritance.” For a Latino chef in a Latino-intensive culture, dealing with preconceptions—evoking warm traditions without simply repeating them—requires a lot of filtering and self-questioning: Does one respond to the cultural or the culinary? At a certain level of craft, and Ruiz and Salgado are there, hard-won proficiency compels in its own kind of way. Though similar in certain broad strokes, the two restaurants are far apart in how they approach food. Salgado makes a lustrous cashew-ancho mole that bathes slivers of Mary’s free-range chicken, whereas the mole that gleams under Ruiz’s seared fillet of salmon is more of a bank shot, with a mortar-and-pestle-pounded paste of chiles, almonds, roasted banana peel, and a lick of brown butter. Other than his vegetarian-friendly corn and black bean sopes, Ruiz hardly uses masa. Salgado couldn’t have a menu without it, but he’s also not shy about alluding to a different realm, displaying a copy of the Mugaritz cookbook and other modernist ur-texts on a shelf by the stove, a nitrous oxide charger—the tool that can whip any liquid into an aerated mousse—sitting beside them like a bookend. The vision thing is clearly what propels both chefs. Ruiz, who grew up in Pasadena with a Mexican mother and Salvadoran father, breezily combines elements of street food with those of family-style cooking. The toasted mustard seeds anchoring an apple cider gastrique (the vinegar’s made in-house, of course) that he spoons over a mound of whipped cotija and dates remind me of the nuts sold by sidewalk vendors in Oaxaca. His chompipe is a paean to the turkey leg served whole at homecomings and Christmas dinners in El Salvador. Basted in its juices, the drumstick is presented, bone and all, on a bun that absorbs the finishing ladle of curtido, or pickled, oregano-flecked cabbage. fueled broth—fiery enough to convey what the agua and chile in the name refer to—the dish is a blend of absolutes; it’s wholly original yet a respectful nod to the classic you can get in storefronts where napkin dispensers and bottles of Tapatío sit on the Formica tables. His restaurant occupies a corner by the entrance of the OC Mix, a rustic-mod mall off the 405 in Costa Mesa crowded with artisanally inclined stores. Here you can rummage through a bin of vinyl records (an exercise in nostalgia for some of us) and score freshly roasted single-origin beans. Salgado first came to the Mix with a food truck to serve tacos at the Saturday farmers’ market. When a slot became available, he pounced, launching the brick-and-mortar Taco María eight months ago with a minimalist decor—white tiles, dark wood counter—and a compact terrace that overlooks a communal garden with olive trees and a fire pit. For those Yelp users expecting to find a joint that serves birdbath-size margaritas and bowls of dip, the austerity can be quite a shock. If Taco María has an almost Japanese aspect to its interior, Corazón y Miel is more gastropub, a few pieces of modern art hanging in a sparely decorated room with a bar on one side and a long banquette beneath the windows on the other. Ruiz launched the place a year ago, with partners Robin Chopra and Travis Hoffacker, in the brick hull of a former dive bar on Atlantic Avenue. Nearby, paleteros push ice cream carts as groups of young women look at the dresses in quinceañera boutiques. Ruiz has known Chopra since kindergarten. The two started a catering company after Ruiz spent three years honing his big-flavored, lipid-intense, merrily indulgent style of cooking under Vinny Dotolo and Jon Shook at Animal. Then the Bell location opened up. There’s something wonderfully enthusiastic about Ruiz’s best cooking, the sense of rules being set aside. He’ll dredge avocado in spiced panko, fry the wedges, and electroshock them with a point of habanero-mango chutney. For carnitas he borrows inspiration from that classic of French picnics—rillettes—forming the slowly rendered pork in a loaf pan. When an order comes in, he cuts and sears a slice, the brown crust barely able to contain the delicious fattiness. I love the pickled vegetables he serves with it, the curving shaved carrots as forceful as the traditional bowl of spicy carrot disks you might be served in a birriería on Florence. Ruiz also offers a tweak on the pickled pork rind cueritos. They’re a ubiquitous snack you can get by the pound nearby at Amapola Market in Bell Gardens, but Ruiz sees the squishy slipperiness as a way to accentuate the crunch of scattered chicharrónes. Candied grapefruit, lemon, and orange zests provide a finishing pop. Where Ruiz’s cooking gives in to the lusty impulse, Salgado’s is one of great precision. I’m still struck by the first time I had his cachetes, or pork cheeks. The flesh was carnita-soft, the accompanying cannellini beans stippled with fresh chamomile and glistening with broth. Each cheek carried a small square of orange peel confit that amplified the meatiness with its touch of acidity. The lunchtime-only tacos start with unbleached masa, the yellowing dough that’s pressed to order, resulting in lovely deckle-edged tortillas. Then he ratchets up the usual complexity of a great taco by layering in surprises like wood-grilled achiote-rubbed beef. The kitchen adds a sliver of red onion steeped in vinegar and hibiscus syrup to the chicken mole taco to underscore how simmered and concentrated the sauce is. Rather than some afterthought, his vegetarian taco features seared shiitake caps in a cheese-intense sauce that’s been thickened with masa—a hip Latin-slanted béchamel. Sure, they may be impossible to hold with your hands, but they’re worth the mess. Salgado began cooking in San Francisco after an IT career didn’t pan out. Armed with a diploma from culinary school, he found himself doing pastry in the Bay Area kitchens of Vernon Morales (Winterland), Daniel Patterson (Coi), and James Syhabout (Commis). A low-key presence in gray shirt and glasses, he seems driven by curiosity, reflecting a wonderful openness to a whole range of influences without ever abandoning an essential heritage. For instance, Salgado uses a dashi broth, which lies at the core of Japanese cooking, to lend crystalline clarity to an epic pozole packed with clams and hominy. The preparation reminds me of Ruiz’s ceviche, a mass of shrimp, octopus, and burned peanuts with soy, ginger, and garlic. Tossed to order instead of being allowed to sit and stew, as ceviche can, it’s fantastic with one of the margaritas barman Darwin Manahan slings in votive candle glassware as a bunch of fans enjoy the show. Taco María won’t ever be accused of having the active bar scene of Corazón, but it does just fine with a tight wine list and drinks like the hibiscus agua fresca, a tall ruby glass served with either sparkling or still water and decked out with cilantro leaves. The festiveness of the drink is something I’d like to see more of in the desserts at Taco María, which are all but nonexistent here. Rather, Salgado ends meals with a lone polvorón that arrives with the check. Good as the crumbly biscuit is, it is a tad strange, considering that the chef has a background in pastry. Ruiz at least attempts desserts, though offering a fruit popsicle doesn’t seem up to the inventiveness of his cooking. The capirotada suggests greater possibilities. A stovetop bread pudding, it’s filled with figs and grilled persimmons, inheriting hints of molasses from an unrefined brown sugar known as piloncillo. I’m not one for labels, but I’ve found myself asking how to identify the cooking of Ruiz and Salgado. Terms like “pan-Latin” or “nuevo latino” don’t quite cut it when you’re talking about something like the tamal at Taco María. Salgado adds kabocha, a Japanese squash, to the masa, then sprinkles queso fresco over the steamed bundle and drizzles avocado honey to draw sweetness from the dab of pipián verde, a Pueblan pumpkin seed sauce. 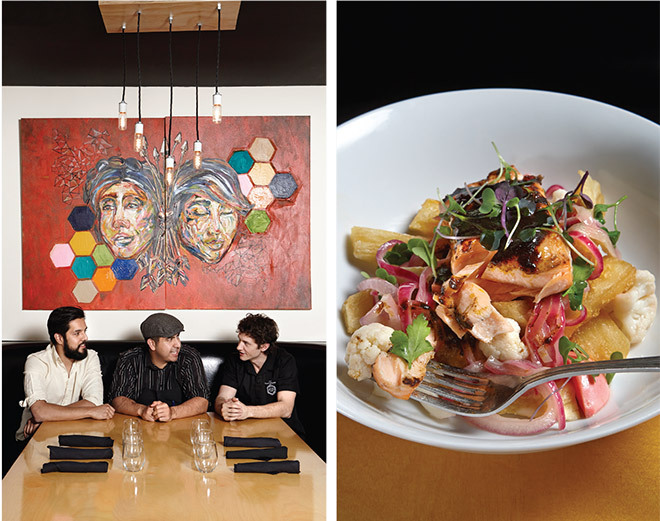 He calls it “Chicano cuisine,” which has a nice, assertive ring to it. To me, though, maybe the best term is simply “New California cuisine.” This is a generation no longer looking to the distant shores of Provence and Tuscany for inspiration but engaging with a border far closer to home. Hours: Dinner: Sun., Tue.-Thu., 5-10; Fri.-Sat., 5-11.